Man, I’m getting T-I-R-E-D of all the Tebow crap getting thrown around. Haters. Fans. Non-Christ followers and Christ followers (both kinds of folks fall into the hater camp as well as Tebow fans). IF you care what I think, I’m indifferent to him unless he’s playing the Bears. I do get lots of amusement when coaches or players pray for a win, instead of to display good character or for safety concerns. What’s God gonna do if the OTHER team prays for the win, too?!?! Honestly, I am about sick of the religious furor over Tim Tebow. What we are seeing the exact problem with American Christianity – we are always looking for the next superstar to validate our faith. 5. The furor over Tebow reminds me of the prosperity gospel. This time, however, it is include Jesus in your touchdown dance and you will get more yards. 6. Tebow himself is not a bad guy; his supporters, fans, followers, fanatics, etc… Ae the ones causing the problem. Don’t bash Tebow for his fans. 7. We are in the middle of an election which is a major thing for our Republic. We need attention focused on the real issues of the United States. We have them you know, and none of them, at all, are connected to whether or not someone getting paid millions of dollars to play a game prays when he gets a few points. 8. The person in front of the camera is not the Christian to always look for… Look for the one in the local church, who organizes a charity bazaar, or helps a family… Celebrate them. And stop trying to “spiritualize” everything… 316 yards? Really? That means what? What about Ecclesiastes 3:16? This entry was posted in Jesus, theology and tagged Jesus, theology. Bookmark the permalink. I agree with a lot of what you said. And I am a big Tebow fan because I am a Bronco fan (lifelong) and I do like seeing a Christian succeed. Some of the Tebow thing is rediculous, i.e. Tebowing. But honestly there are a few great things about this story from my pastoral perspective. 1) Just like other Christian heroes of the faith, missionaries and martyrs included, Tebow is giving people courage to live their faith in the public. “Let you light shine before others, so that they may see your good works and give glory to your Father who is in heaven.”- Jesus. 2) Colossians 3:23 “Whatever you do, work heartily, as for the Lord and not for men.” God might not care about football and who wins or loses. But he commands us to work for him in whatever we do, that includes football. In his press conferences he talks about the disadvantaged children he invites to games and how he spends time with them before these games. He says that these are highlights of his day- even when they win playoff games. He recognizes that football isn’t important in and of itself. It’s a platform for truly important things-loving God and loving people. 3) For many people the Bible is so far removed from our cultural landscape as we know it that it is nice to point to someone in the community, whether it be another pastor, missionary, football player, mom, dad, etc who lives their faith in a way we can relate too. He makes modern day faith based on an ancient book tangible. 4) Because this is overblown by the media, it’s opened the floodgates for theological conversation with all people of all walks of life. That’s pretty cool if you ask me. ESPN is wrestling with theology. Players on the Miami Dolphins have “grown closer to God” according to one of their Christian teammates after playing against him. You are right Brian, the media and fans are creating the madness. And I see a lot of good coming from it. I don’t see him as a stamp of approval as much as someone people can learn from. Paul said, “Be imitators of me, as I am of Christ.” (1 Cor 11:1). People look to others for how to live. I’d love to see people in our culture imitate Tebow because he’s trying to imitate Christ in his life. He’s humble, lives according to Biblical values, isn’t egocentric, and loves God and people. 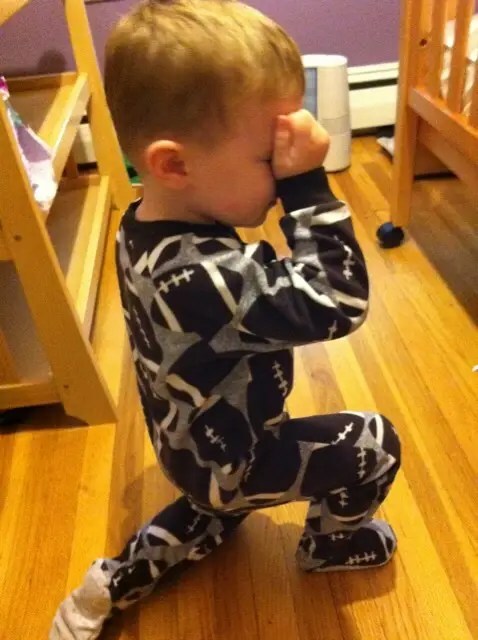 I pray for Tebow. I pray that when he makes a mistake in character or a sin becomes known (because we know he’s not Jesus and without sin) that the media doesn’t jump on him and i pray that it does not cause people to stumble. I pray that it draws people to Christ. And I fully recognize that I am biased. He plays for both teams I cheer most for – the Church and Jesus. Hope this makes sense and is read in the friendly manner it was written in. bahahahahaha here’s a prime example of what you distain. me too. this is ridiculous.